Why Is Islam Growing So Fast in the US? Yes, the fastest growing religion in America is now Islam. This may be a shock to the Christians considering they've been on top for years. But with immigration and conversion of religion going on, you can't stop Islam from spreading. Even though Christianity is the largest religion in America, Islam is the fastest growing. I think that Islam is the fastest growing religion in America because the word about their religion is spreading. In just ten years, 2000 to 2010, the number of Muslims has increased significantly. From 1 million to 2.6 million, that's a 66.7 percent increase. With the increase in Muslims means an increase in mosques. In 2000 there was 1,200 mosques, today there are 2,106 mosques. Most of the funding for these mosques doesn't come from our taxes, but instead from overseas. Most of the increase in Islam is from immigration. About 39 percent is from immigration. There is so many Muslim immigrant children in America that some of the schools are changing their calenders to add in Muslim holidays and prayer time. Dearborn is a good example of a school that has a lot of Muslims in it. They have a mosque in Dearborn that calls out the five daily prayers so that the whole community can hear them. Muslims aren't as bad as people think they are. Most of the Muslim priest encourage their followers to participate in American activities and American politics. A lot of Muslims also say that violence is never okay. There are now 7 million Muslims in America now and half of those 7 million are American-born. The stereotype on Arab Muslims is very wrong because most Arabs aren't Muslims and most of the Muslims aren't Arabs. With the number of increasing Muslims, there needs to be more mosques for them to go to. 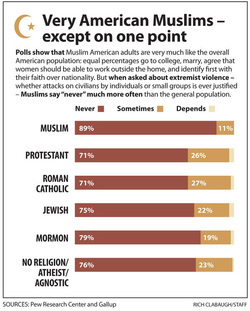 Even though the American stereotype of Muslims is bad, they say that extremist violence is never justified more often then your typical "church freak" protestants. Magagnini, Stephen. "Islam-The Fastest Growing Religion in USA." Tell Me About Islam. Allah, n.d. Web. "The Fastest Growing Religion In America Is Islam." End Of The American Dream. End of the American Dream, 3 May 2012. Web. 22 May 2014. "Number of U.S. Mosques up 74% since 2000." USATODAY.COM. USA TODAY, 29 Feb. 2012. Web. 22 May 2014. This subject connects to AP Human Geography with the chapters religion and migration from the book. It ties into religion because it is about religion (pretty obvious). It ties into migration because most of the population increase of Islam is from migration (also, a little obvious, if you read it). I chose to do my pulse project on Islam because I find Islam really interesting and I respect their culture and like to learn as much as I can about the religion. ^I really like this video, I highly suggest you watch it. It makes you think twice about stereotypes.